Sunday featured R48 and SR48 finals rematches from four weeks ago in Las Vegas, as Killian Carroll and Sean Lenning collided for the fourth time this season and Marcos Chavez and David Fink clashed for the third time in four weeks. 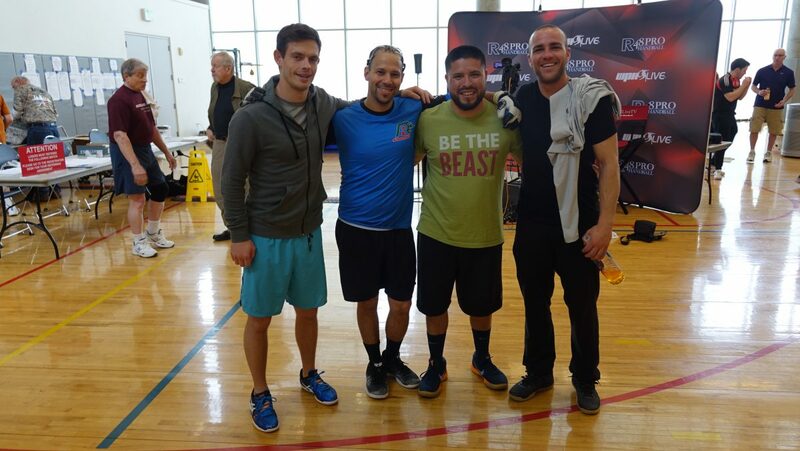 The “Flying Cordovas” met in the fifth place final, while newcomer Max Langmack faced Elite 8 invitee Vic Perez for ninth place. Sean Lenning staged one of the most exciting and dramatic comebacks in R48 history in handing Killian Carroll his first loss of the R48 7 season, rallying from a 0-9 third game deficit to clinch his first R48 title in 22 months in Las Vegas. Carroll stated that he was looking forward to a rematch after his quarterfinal victory on Saturday, and when both advanced to the final on Saturday night, the rematch became official. Carroll led the R48 head to head against Lenning 6-2, having lost the first and last encounters and winning all six match-ups in between. Carroll played with purpose and conviction in game one, setting the tempo with a hard power serve and bottom board kills to dominate game one, 15-1. “It wasn’t like Lenning was playing badly, there was just nothing he could do,” stated R48 pro Ryan Bowler. 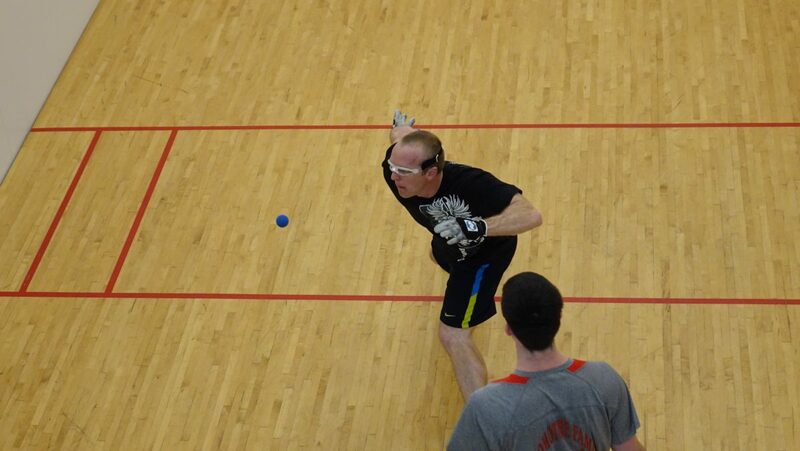 Lenning turned the table in game two, applying pressure against the two-time defending Player’s Champion and seizing an 11-3 lead. Appearing to be fatigued after his second game surge, Lenning called a timeout and would not score for 10 minutes, as his lead was erased. Trailing 11-12, Lenning ended his drought, scoring three quick points to serve for the game at 14-12. On the seventh shot of the 14-12 rally, Lenning chose to pass from 32 feet rather than kill, bringing the pass shot off the back wall and resulting in a Carroll rollout. “Killian just moves his feet so well and gets into such great position that if the ball hits the back wall, he is likely going to roll it out,” stated Bowler. Lenning never served again, as Carroll clinched his fourth R48 title of the season with four straight points to defend his Houston R48 title. “I wouldn’t say I came in with a vindictive mindset (playing Sean), but I definitely wanted to get back on track and not allow one loss to become another,” stated Carroll in his post match ESPN interview. Luis and Daniel Cordova met for the sixth time in R48 play in Houston’s fifth place final, a rematch of last year’s fifth place final in Houston. The flying Cordovas played one of the most exciting matches of the tournament, with both brothers living up to their nicknames, flying, diving, and sliding on virtually every rally. Never separated by more than two pints in the second half, Danos found his right hand kill to separate himself from Lucho down the stretch. A right corner pinch and a right hand back wall kill straight down the right wall pushed Danos over the line for his third fifth place finish of the season, while Lucho’s loss dropped him from a tie for third to fifth on the R48 Power Rankings. 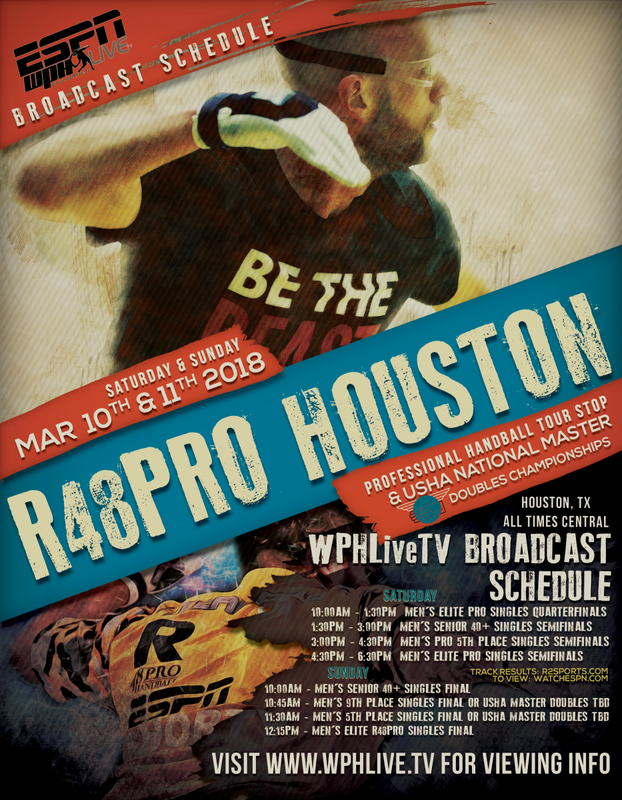 The tallest handball pro in history, 6’7 Max Langmack made a sensational R48 debut in Houston, advancing to the ninth place final with two impressive qualifier wins and two eye-opening playoff wins. Langmack would face perennial top 10 R48 star Vic Perez in the final. Langmack continued his outstanding play in the ninth place final, building a 13-3 lead and eventually leading 15-10 at the half against the R48 veteran. Perez found the range with his right and left hand kills in the second half, outscoring Langmack 15-0 en route to his third ninth place finish of the season. Marcos Chavez was seeking his tenth SR48 title on Sunday in Houston, but would have to overcome fellow Elite 8 rival David Fink. Chavez and Fink met in the Las Vegas SR48 final four weeks ago, with Fink clinching his first SR48 title in his maiden start. Fink started hot in the final against the top seed, scoring 12 points in his first inning to take control of the match. Chavez was never able to find his game, as Fink kept Chavez on his heels with a two-way power serve and fly kills to clinch his second SR48 title in two starts and the SR48 #1 ranking. 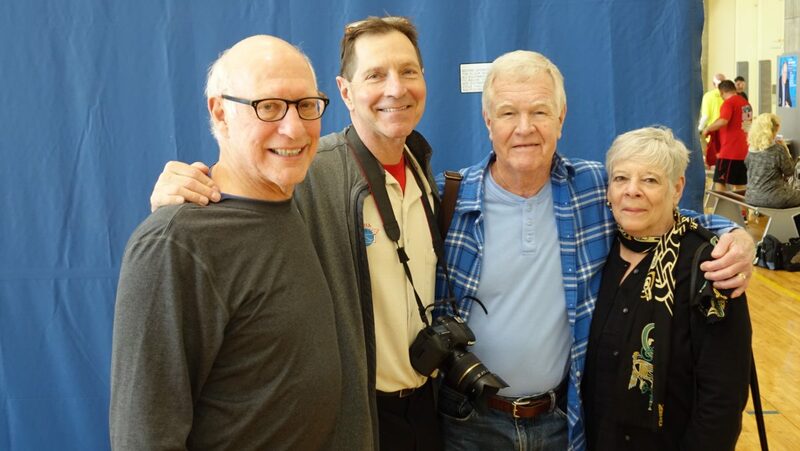 Thank you to the Houston Handball Club, Ron Cole, Sandy Gaitz, John Egbert, and all of the amazing people who hosted, organized, and ran the event. Thank you to the USHA for hosting the Master’s Doubles, in conjunction with the R48 7 Houston. Thank you to the WPH staffers and film crew for another incredible R48 event. Tucson, AZ, WPH Press, 3/12/18– Killian Carroll bounced back from his first loss of the R48 7 in Las Vegas with an emphatic statement win in Houston, outscoring his four opponents 120-30 en route to his fourth R48 title of the season. 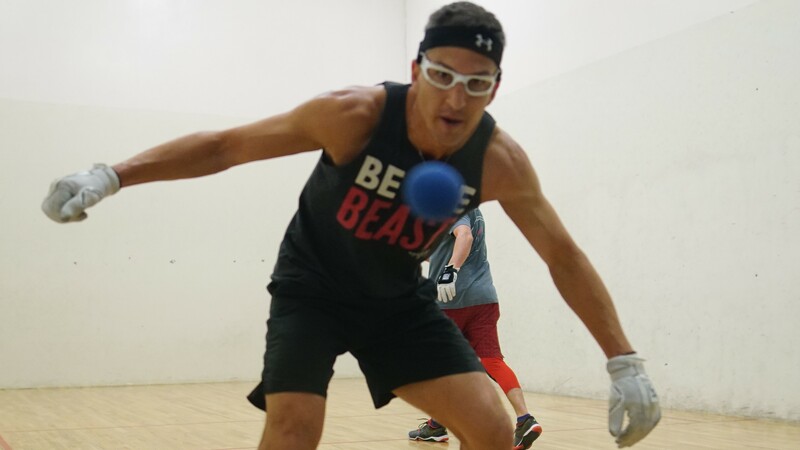 Sean Lenning solidified his #2 ranking with his second consecutive final, while David Fink and Mando Ortiz remained tied for third in the rankings. Luis Cordova dropped from #3 to #5 in the rankings with a 5th place playoff loss to his brother, while Marcos Chavez dropped out of the Elite 8 with a first round loss to Dave Munson. Shorty Ruiz’s first R48 main draw victory catapulted the cross over star into the R48 top 13 for the first time. On the SR48, David Fink won his second SR48 title in his second SR48 start, toppling 9-time SR48 champion Marcos Chavez in the second straight SR48 final of the 2018 season. With the SR48 title in Houston, Fink claimed the SR48 #1 ranking for the first time. 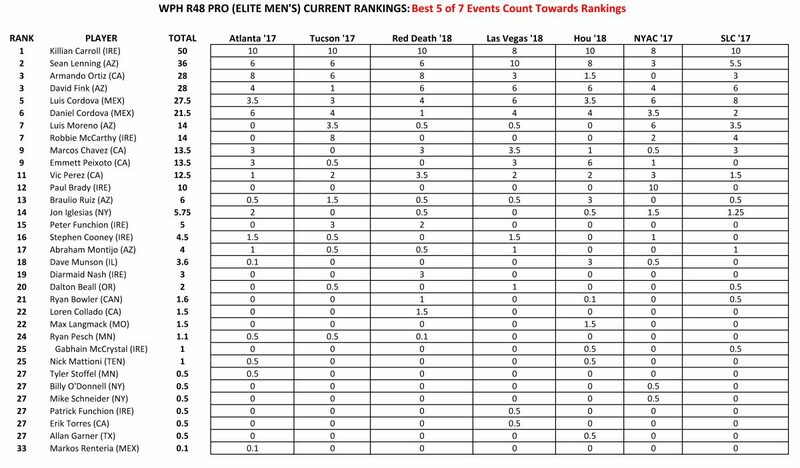 See all of the post R48 and SR48 rankings below. Following a dramatic Friday in Houston that featured two thrilling R48 tiebreakers and two of the top eight seeds bounced from the draw, the eight remaining R48 stars battled for spots in the semifinals and finals on Saturday, while the SR48 also staged its quarterfinals and semifinals. Shorty Ruiz earned his first quarterfinal appearance in 20 R48 starts with his dramatic win against Vic Perez on Friday and faced R48 #1 Killian Carroll. 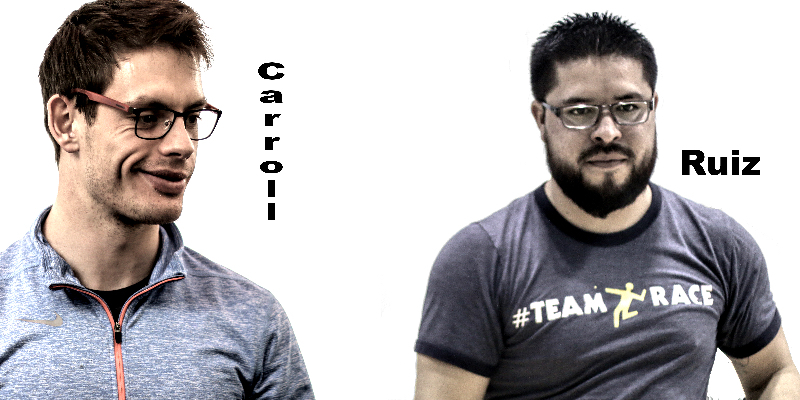 Carroll owned a 2-0 R48 record against Ruiz, including a round of 16 victory earlier this season. Carroll was too strong for Ruiz in the first quarterfinal of the morning, hitting 14 unreturned serves in two games and allowing the cross over star to score just two points. Emmett Peixoto dispatched two-time R48 7 finalist Mando Ortiz in Friday’s opening round to face fifth-seeded Daniel Cordova, who was sensational in taking down former WPH #1 Allan Garner in the opening round. Peixoto entered the quarterfinal clash against Danos with a perfect 6-0 record and aimed to extend his unbeaten streak against the R48’s top hop artist to advance to his first semifinal of the season. Peixoto started slowly in game one vs. Danos, trailing 8-1 before making adjustments. “I was trying to paddle his serve back slowly but that wasn’t working,” stated The Rock. “Daniel’s serve was hopping two feet either way and I just started to hit the return hard and put the ball in the back of the court.” Peixoto’s strategy worked, as he tied the game at nine and continued to score en route to a first game win. Peixoto continued to frustrate Danos in game two, keeping the rising R48 star off balance with hooks during the rally. Peixoto led 10-2 in game two when Danos turned the tide, climbing to within one at 10-11. Peixoto would not be denied, overcoming the Danos’ streak to advance to his first R48 semifinal in more than a year. “I really just came here to have fun and I’m really excited to be in the semis,” stated Peixoto to ESPN’s Kara Mack after the match. 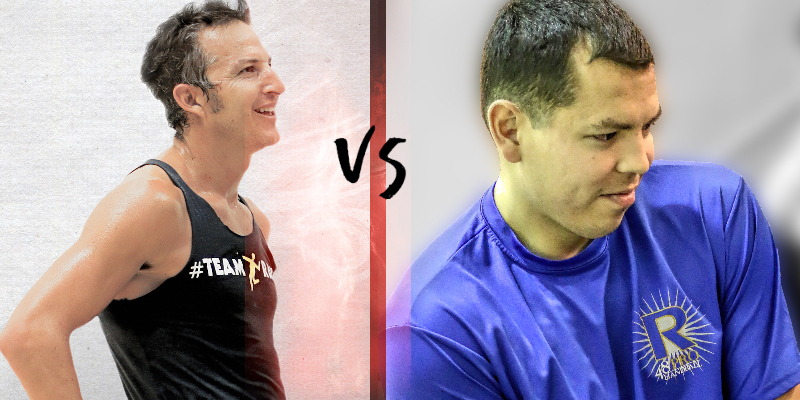 David Fink and Luis Cordova have established one of the best rivalries on the R48 tour since their first meeting during the first R48 season in 2012, with Fink winning their first three encounters and the pair splitting the next six meetings. Fink took charge midway through the first game with the score tied at five, reeling off nine of the next 10 points and closing out the game with a one-inch high kill. Fink kept his foot on the gas in game two, never allowing the pride of Juarez into the match en route to his third consecutive R48 semifinal. “I’ve never seen Fink shoot the ball that low and consistently,” stated ESPN broadcaster and R48 pro Allan Garner. S ean Lenning entered Houston on the heels of his sensational R48 win in Las Vegas last month, while Dave Munson earned his first R48 quarterfinal appearance with one of the best comebacks in R48 history against Marcos Chavez in Friday night’s round of 16. With “The Thrill” and “The Midwest Sharpshooter” meeting for the first time in R48 play, Lenning served the second donut of the quarterfinal, dominating TMS with blistering serves and kills to cruise to his fifth semifinal of the season. Killian Carroll and Emmett Peixoto met for the second consecutive event in the upper bracket semifinals. Carroll directed traffic with his sensational serve, kills, and speed, while being aided by a surplus of Peixoto errors. “I don’t know what was happening in there,” stated Peixoto. “I had the shots I wanted and just couldn’t make them.” Carroll advanced to his ninth consecutive R48 final and will be seeking his seventh R47 title in nine events on Sunday. 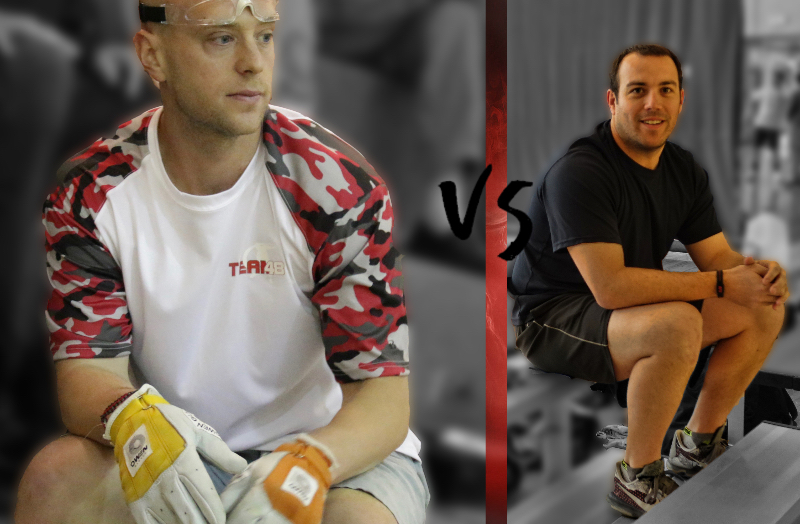 Sean Lenning and David Fink met in the second semifinal, with the pair splitting 10 previous R48 matchups. Fink continued his solid play through the first half of game one, taking an 11-8 lead. A missed fly kill opportunity killed Fink’s momentum and Lenning took advantage, scoring seven of the final nine points of the game. Lenning raced to a 10-2 lead in game two, only to see his advantage cut to one on the heels of a Fink offensive barrage. Lenning weathered the storm, scoring the final five points of the match to advance to his second consecutive R48 final. Elite 8 R48 stars Marcos Chavez and David Fink cruised through Saturday’s SR48 quarterfinals and semifinals to setup their third meeting in two events. Chavez was explosive in dismissing Dr. Dan Zimet for the second consecutive event, while Fink overwhelmed Las Vegas’ Joe Harris in the bottom bracket semifinal en route to his second SR48 final. For people to watch LIVE on ESPN3 they would go to www.watchESPN, then ESPN3 to watch Handball. Thanks for Sharing! The R48 kicked off its sixth consecutive year in Space City at the Tellepsen Downtown Family YMCA with the R48 qualifier on Friday morning, the R48 main draw on Friday afternoon, and the SR48 on Friday evening. Houston’s qualifier featured top talent from across North America, with 26 of the game’s top players vying for eight spots in Houston’s R48 main draw. Top-seeded Houston qualifier and former R48 #2 Emmett Peixoto cruised past collegiate All-American Sam Esser to qualify for the second consecutive event, while second-seeded Jonathan Iglesias survived 40+ national champion George Garcia, Jr. to qualify for the third time this season. Tucson’s Abraham Montijo found himself trailing collegiate All-American Max Langmack 23-12 in his attempt to qualify for the fifth time this season, and despite scoring seven consecutive points to cut the deficit to 19-23, Langmack closed out the match to qualify for the first time, and at 6’7, became the tallest handball pro in the history of the pro tour. Shorty Ruiz was sharp against former Elite 8 invitee Anthony Selestow, never allowing “The Throb” to impose his ground and pound style. “His serves were just too tough and I couldn’t do anything with them,” barked Selestow. 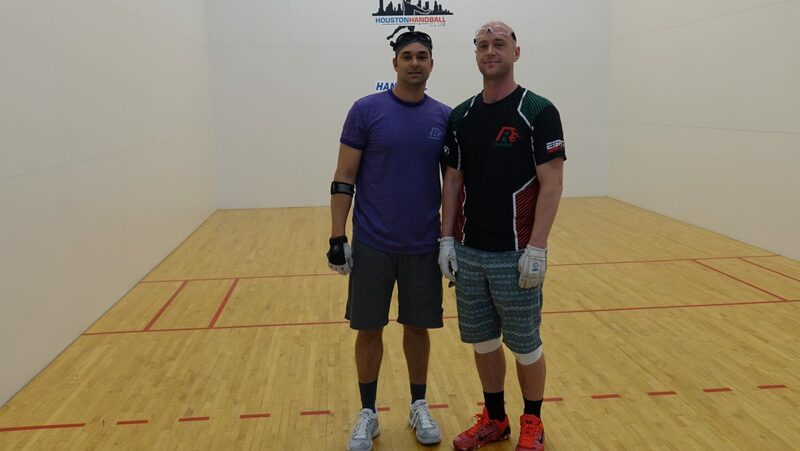 Dave Munson won a rematch from the 2016 Houston qualifier final with Canada’s Ryan Bowler, overcoming a first-half deficit as he had in 2016 to qualify for the first time this season. “I was playing well in the first half and took a 15-8 lead but I just couldn’t keep it going in the second half,” lamented Bowler. Former Triple A pitcher and junior national champion Nick Mattioni ousted Texas’ Adam Bernhard, dominating the second half after a slow start to qualify for the second time in his R48 career. Ireland’s Gabhain McCrystal overcame a feisty Loren Collado to qualify for the first time this season, while Allan Garner made his first R48 start in two years and defeated Chicago’s Mike Munson. Killian Carroll entered Houston as the defending champion and three-time R48 7 champion and was joined by his fellow Elite 8 peers in Friday’s opening round. Houston’s “Elite 8 Choice” blind draw allowed the Elite 8 stars to choose their opponents based on the number they picked out of the hat. Carroll selected fourth and chose Jonathan Iglesias, defeating the Coloradan by way of New York in two lopsided games. “I felt like I couldn’t even return the serve,” stated a dejected Iglesias. Sean Lenning made quick work of former pro pitcher Nick Mattioni, needing just 19 minutes to advance to the quarterfinals. 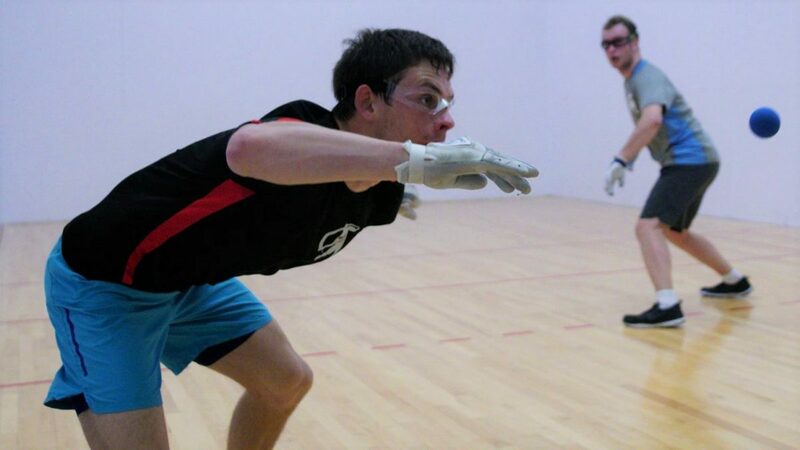 Third-seeded David Fink faced the tour’s newest star and tallest pro handball player in history, Missouri State’s Max Langmack. Despite Langmack’s 18-year age advantage, Fink cruised in two. “Max has a really good game and a great attitude,” stated WPH ambassador Rodney Fink. Daniel Cordova chose eighth and was forced to choose the former WPH #1, Allan Garner. Danos ended Garner’s comeback in just 23 minutes, winning the battle of Texas and advancing to the quarterfinals with authority. Luis Cordova continued his stellar season, dominating Ireland’s Gabhain McCrystal in two games to advance to his fifth quarterfinal of the season. 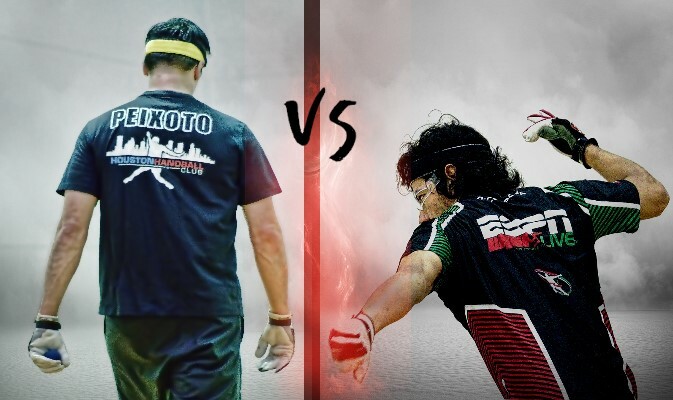 Marcos Chavez faced Chicago’s Dave Munson for the second time in three years and controlled the first game and a half against the Midwest star. Trailing 15-3, 9-3, Munson started his comeback. Chavez served for the match four times at 14, but Munson fought off each attempt, forcing overtime and eventually forcing a third game. Chavez built a sizeable advantage in game three, leading 11-6 and seemingly poised for his fourth quarterfinal of the season. Munson caught fire, tying the score at 13 and earning the 14th point with a back wall mouse from 36 feet. “I’ve never hit a shot that good in my life but I just told myself that I had nothing to lose so I went for it.” Munson punctuated one of the best comebacks in R48 history with a left wall flat crack ace to win his first R48 main draw match. The LAAC’s Vic Perez and former L.A. star now living in Tucson, Shorty Ruiz met for the final spot in Saturday’s quarterfinals. Ortiz led 14-6 in game one before a furious Ruiz rally cut the deficit to 13-14. Perez escaped game one, 15-13, but Ruiz carried his late first-game momentum into game two, forcing a third game, 15-11. The pair were never separated by more than four points in the tiebreaker, with Ruiz maintaining a slight edge until reaching match point at 14-11. Serving for his first round of 16 win of his R48 career, Ruiz appeared to have won the match with a stiff-arm left kill, but just as Ruiz made contact, the referee called a screen. Perez earned a side out on the next rally but was unable to capitalize, as Ruiz regained the serve and clinched the match on his second attempt. “I finally got the monkey off my back,” barked an ecstatic Ruiz. The SR48 contested its second event of 2018 with round of 16 action on Friday night, as former SR48 Player’s Champion Andy Schad made his first SR48 start in nearly two years, while Texas’ Bryan Holmes, Mark Gilmer, and Adam Berliner joined SR48 stars Dan Armijo, Dr. Dan Zimet, and George Garcia were also in action on Friday night.